“Theoretically speaking…” | "But what about..."
If the content of this unit was an ocean, and i was a swimmer (a strong one, mind you) i would be under water, near drowning in the amount of content that this unit has. but first, before we get to the really confusing definition stuff; let’s define between a theory, a model and an effect. Theory – scientifically, this is a well substantiated explanation about certain factors in the world, which is based upon knowledge that can be, and has been, repeatedly confirmed through observation and experimentation. Model – This is a way of representing empirical objects in a logical and objective way. We use models when it is impossible or impractical to created experimental conditions where we can scientifically observe findings. Effect – this is a scientific law, hypothesis or phenomenon. We do A and B is always meant to follow. Interference Theory – This suggests that some memories compete and interfere with other memories. The likelihood of this happening is relative to how similar the two pieces of information are; if they are every closely similar then they have a higher change of interference. There are two types; proactive – where an old memories tries to muscle out the new memory; and retroactive; where the new guy makes it harder to remember the old guy. Binding-of-item-and-context Model – this is the way that we explain how we remember contextually important content. Face Inversion effect – this is used to describe what happens when a face is made markedly more difficult when it is presented to us upside down. this is thought to be innate, as infants as young as 3-5 months have shown this effect. Status Quo Bias – this describes how people are more preferential to the current state, or baseline, that they are in, and if there is a diversion from that baseline is viewed as a loss. – The phonological loop: holds information about what we hear. 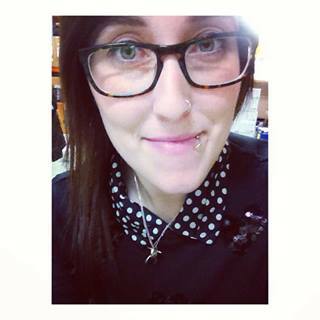 temporary storage of linguistic and verbal information. – the visuo spatial sketchpad: holds information about what we see. temporary storage of spatial and visual information. – episodic buffer: this is that which transfers between the central executive and the phonological loop and visuo spatial sketchpad. linked to the retention of long term memory. – central executive: this is modality free, and serves to co-ordinate both the visuo spatial sketchpad and the phonological loop. Part-whole Effect – that holistic and configurational aspects of face recognition exist. indicates some kind of configural processing for facial parts. Stroop Effect – a demonstration of what interference can do on a task. In the Stroop task a colour word is presented “RED” but can be coloured either by red or any other variation. The task is to show how the presentation of two visual stimuli presented together affect each other. 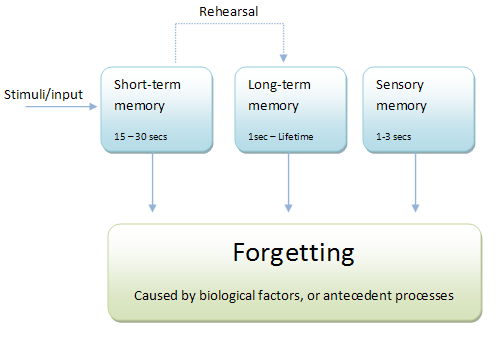 Unitary Memory model – that each part of memory can be broken down into units; this is the most current model. An example of this is Baddeley’s working memory model. Typicality effect – this suggests a reason as to why participants in studies respond quicker to factors that are more typical than atypical. For example, in an experiment that one was asked to name a bird the typically of response would be more towards “sparrow” than “penguin”. 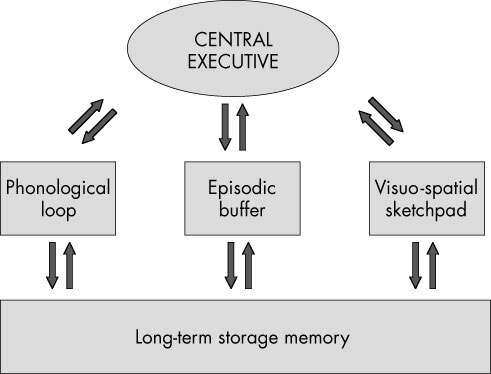 Multiple Resource Theory – (Wickens) suggests that humans do not just have one memory storage that they tap information from but many that can be simultaneously switched on and made functional. distinguishes between ST and LT. Distributed plus-hub theory – this theory has to do with the anterior temporal lobe being an amodal hub that binds together specific pieces of semantic information. 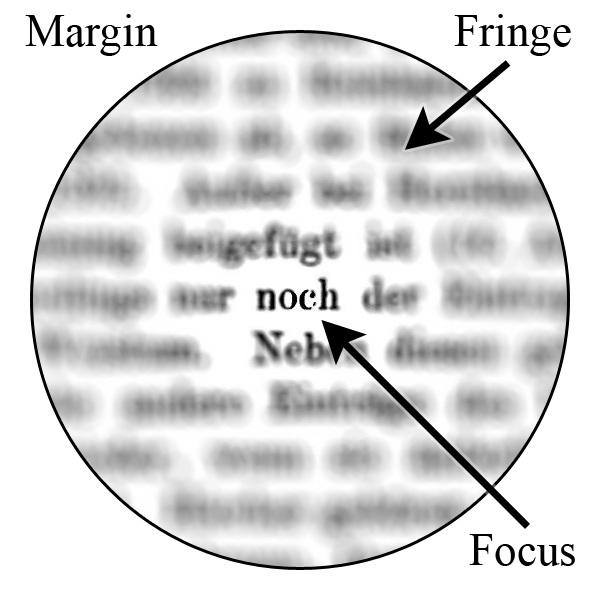 Posner’s spotlight light theory- this model is one way of explaining how attention is focused. the spotlight that Posner refers to, is focused on what is in the participants immediate attention and everything outside of that spot light is void and unattended. It also explains how our attention can be guided by exogenous (bottom up) or endogenous (top down) processing. this is shown in a response time task. 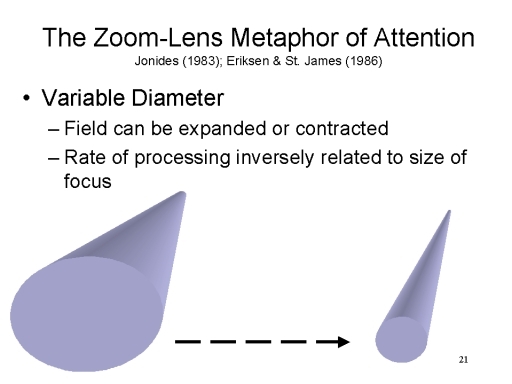 Erikson’s Zoom lens Model – that attention is not a spotlight but something that can be both focused in small but also focused out to a larger field. object based Theory – this states that our attention is based on the shape of the object or the object that we need to attain. This helps explain why where there is two photos superimposed over one another we can quickly decipher each when told which to view specifically. States that if vision is object based, it is not therefore location specific. inhibition of return – if we look at a particular area of space for a certain amount of time it is unlikely that we will return our visual gaze back to that space. This show bias favouring. Neglect – (this is none of the above but is important) patients who suffer from neglect fail to acknowledge objects in the field contralateral (fancy word for opposite) to their lesion. They are able to detect one object out of a set of many presented, but if another object is shown like a spoon then they can only see the spoon and not any, including the initial, objects. Well, now; wasn’t that ridiculously tiring.